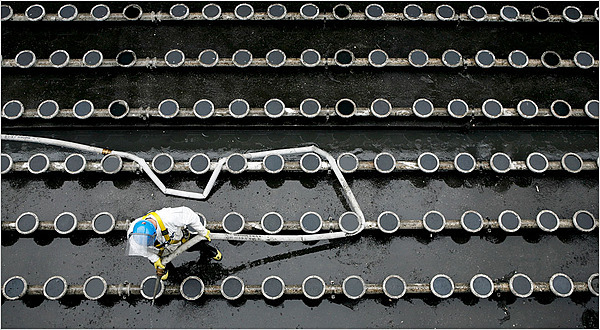 A worker maintaining a tank at a Brooklyn wastewater treatment plant. Half the rainstorms in New York overwhelm the system. It was drizzling lightly in late October when the midnight shift started at the Owls Head Water Pollution Control Plant, where much of Brooklyn’s sewage is treated. A few miles away, people were walking home without umbrellas from late dinners. But at Owls Head, a swimming pool’s worth of sewage and wastewater was soon rushing in every second. Warning horns began to blare. A little after 1 a.m., with a harder rain falling, Owls Head reached its capacity and workers started shutting the intake gates. That caused a rising tide throughout Brooklyn’s sewers, and untreated feces and industrial waste started spilling from emergency relief valves into the Upper New York Bay and Gowanus Canal. One goal of the Clean Water Act of 1972 was to upgrade the nation’s sewer systems, many of them built more than a century ago, to handle growing populations and increasing runoff of rainwater and waste. During the 1970s and 1980s, Congress distributed more than $60 billion to cities to make sure that what goes into toilets, industrial drains and street grates would not endanger human health. But despite those upgrades, today, many sewer systems are still frequently overwhelmed, according to a New York Times analysis of environmental data. As a result, sewage — including human excrement and dangerous industrial chemicals — is spilling into waterways. systems — including those in major cities — have reported violating the law by dumping untreated or partly treated human waste, chemicals and other hazardous materials into rivers and lakes and elsewhere, according to data from state environmental agencies and the Environmental Protection Agency. But fewer than one in five sewage systems that broke the law were ever fined or otherwise sanctioned by state or federal regulators, the Times analysis shows. It is not clear whether the sewage systems that have not reported such dumping are doing any better, because data on overflows and spillage are often incomplete. A 2007 study published in the journal Pediatrics, focusing on one Milwaukee hospital, indicated that the number of children suffering from serious diarrhea rose whenever local sewers overflowed. Another study, published in 2008 in the Archives of Environmental and Occupational Health, estimated that as many as four million people become sick each year in California from swimming in waters containing the kind of pollution often linked to untreated sewage. Around New York City, samples collected at dozens of beaches or piers have detected the types of bacteria and other pollutants tied to sewage overflows. Though the city’s drinking water comes from upstate reservoirs, environmentalists say untreated excrement and other waste in the city’s waterways pose serious health risks. “After the storm, the sewage flowed down the street faster than we could move out of the way and filled my house with over a foot of muck,” said Laura Serrano, whose Bay Shore, N.Y., home was damaged in 2005 by a sewer overflow. Ms. Serrano, who says she contracted viral meningitis because of exposure to the sewage, has filed suit against Suffolk County, which operates the sewer system. The county’s lawyer disputes responsibility for the damage and injuries. When a sewage system overflows or a treatment plant dumps untreated waste, it is often breaking the law. Today, sewage systems are the nation’s most frequent violators of the Clean Water Act. More than a third of all sewer systems — including those in San Diego, Houston, Phoenix, San Antonio, Philadelphia, San Jose and San Francisco — have violated environmental laws since 2006, according to a Times analysis of E.P.A. data. Thousands of other sewage systems operated by smaller cities, colleges, mobile home parks and companies have also broken the law. But few of the violators are ever punished. In the last year, E.P.A. settlements with sewer systems in Hampton Roads, Va., and the east San Francisco Bay have led to more than $200 million spent on new systems to reduce pollution, the agency said. In October, the E.P.A. administrator, Lisa P. Jackson, said she was overhauling how the Clean Water Act is enforced. But widespread problems still remain. Plant operators and regulators, for their part, say that fines would simply divert money from stretched budgets and that they are doing the best they can with aging systems and overwhelmed pipes. New York, for example, was one of the first major cities to build a large sewer system, starting construction in 1849. Many of those pipes — constructed of hand-laid brick and ceramic tiles — are still used. Today, the city’s 7,400 miles of sewer pipes operate almost entirely by gravity, unlike in other cities that use large pumps. New York City’s 14 wastewater treatment plants, which handle 1.3 billion gallons of wastewater a day, have been flooded with thousands of pickles (after a factory dumped its stock), vast flows of discarded chicken heads and large pieces of lumber. When a toilet flushes in the West Village in Manhattan, the waste runs north six miles through gradually descending pipes to 136th Street, where it is mixed with so-called biological digesters that consume dangerous pathogens. The wastewater is then mixed with chlorine and sent into the Hudson River. But New York’s system — like those in hundreds of others cities — combines rainwater runoff with sewage. Over the last three decades, as thousands of acres of trees, bushes and other vegetation in New York have been paved over, the land’s ability to absorb rain has declined significantly. When treatment plants are swamped, the excess spills from 490 overflow pipes throughout the city’s five boroughs. When the sky is clear, Owls Head can handle the sewage from more than 750,000 people. But the balance is so delicate that Mr. Connaughton and his colleagues must be constantly ready for rain. They choose cable television packages for their homes based on which company offers the best local weather forecasts. They know meteorologists by the sound of their voices. When the leaves begin to fall each autumn, clogging sewer grates and pipes, Mr. Connaughton sometimes has trouble sleeping. “I went to Hawaii with my wife, and the whole time I was flipping to the Weather Channel, seeing if it was raining in New York,” he said. New York’s sewage system overflows essentially every other time it rains. Reducing such overflows is a priority, city officials say. But eradicating the problem would cost billions. Officials have spent approximately $35 billion over three decades improving the quality of the waters surrounding the city and have improved systems to capture and store rainwater and sewage, bringing down the frequency and volume of overflows, the city’s Department of Environmental Protection wrote in a statement. “Water quality in New York City has improved dramatically in the last century, and particularly in the last two decades,” officials wrote. The E.P.A., concerned about the risks of overflowing sewers, issued a national framework in 1994 to control overflows, including making sure that pipes are designed so they do not easily become plugged by debris and warning the public when overflows occur. In 2000, Congress amended the Clean Water Act to crack down on overflows. But in hundreds of places, sewer systems remain out of compliance with that framework or the Clean Water Act, which regulates most pollution discharges to waterways. And the burdens on sewer systems are growing as cities become larger and, in some areas, rainstorms become more frequent and fierce. New York’s system, for instance, was designed to accommodate a so-called five-year storm — a rainfall so extreme that it is expected to occur, on average, only twice a decade. But in 2007 alone, the city experienced three 25-year storms, according to city officials — storms so strong they would be expected only four times each century. “When you get five inches of rain in 30 minutes, it’s like Thanksgiving Day traffic on a two-lane bridge in the sewer pipes,” said James Roberts, deputy commissioner of the city’s Department of Environmental Protection. To combat these shifts, some cities are encouraging sewer-friendly development. New York, for instance, has instituted zoning laws requiring new parking lots to include landscaped areas to absorb rainwater, established a tax credit for roofs with absorbent vegetation and begun to use millions of dollars for environmentally friendly infrastructure projects. Philadelphia has announced it will spend $1.6 billion over 20 years to build rain gardens and sidewalks of porous pavement and to plant thousands of trees. But unless cities require private developers to build in ways that minimize runoff, the volume of rain flowing into sewers is likely to grow, environmentalists say. lawmakers and water advocates, is extensive new spending on sewer systems largely ignored for decades. As much as $400 billion in extra spending is needed over the next decade to fix the nation’s sewer infrastructure, according to estimates by the E.P.A. and theGovernment Accountability Office. Legislation under consideration on Capitol Hill contains millions in water infrastructure grants, and the stimulus bill passed this year set aside $6 billion to improve sewers and other water systems. Please note: Pre-registration is required for all programs since they are weather contingent. For outings, please wear appropriate clothing, sturdy hiking shoes, and bring plenty of snacks and water. Our hikes will include stops along the way to interpret natural and historic features. We hike at the pace of our slowest hiker. A parent or guardian over the age of 18 years must accompany children wishing to participate in programs. Join environmental educator Laura Conner for a two-mile long hike in the beautiful and often missed Peter's Kill area. This hike, which does include one steep hill, features two stunning, cliff-top views that are well worth the effort to reach. Along the way, we'll look for relics of the former Ski-Minne area. Meet at the Peter's Kill Area. Join a park naturalist for an easy-going walk on the Awosting Falls carriage road from the Peter's Kill Park Office up to Awosting Falls and back again. This three mile round trip walk has a moderate incline and travels past interesting sections of lichen covered Shawangunk quartz conglomerate. Meet at the Peter's Kill Area. Pitch Pines, White Pines, Hemlocks; they're all green, who can tell the difference? You can! Or you'll be able to after this one-mile hike led by Park educator Jillian Koehnken. Along the way, participants will learn about the distinguishing characteristics between many of the evergreens populating Minnewaska, including pitch pines and hemlocks! Meet at the Peter's Kill Area. Tis the season of evergreens! Whether it is the traditional Christmas fir, or the majestic Norway Spruce, the color green is one of the only ones seen in the winter trees of Minnewaska. Learn basic differences between many of the confusing conifers found in the Park Preserve, including species not discussed in Confusing Conifers Part I. This program is recommended for patrons over the age of twelve. Join a park naturalist for a two-mile loop along Castle Point carriage road, meandering through the old resort golf course and orchard and back down to the Upper Awosting carriage road. This modest walk offers terrific views of the Catskill Mountains and a chance to visit a quiet yet close area of the Park Preserve. Need a break from all the pre-holiday frenzy? Come join environmental educator Laura Conner on a leisurely stroll around Lake Minnewaska. We will explore some of the side paths to cliff-top scenic views and visit the site of one of the famous resorts from the past. This two-and-a-half mile walk will feature a short walk through the former golf course and along the Beacon Hill area. Bring your children to the Minnewaska Nature Center to learn about wild animals and their strategies for survival through this cold season. A hands-on demonstration about animals will be followed by a teacher-led art lesson for each child to create their own wildlife journal. Participants will fill these mini books with pictures that describe winter survival strategies for wildlife. And, these activities will be followed by a brief walk to look for signs of animal activity. This program is recommended for children between the ages of six to ten years old accompanied by an adult over the age of 18 years. This survival skills workshop will take you into the back country of Minnewaska's Peter's Kill area. Here you will learn several outdoor skills hands-on, including orienteering, leave-no-trace, proper preparation for a long hike and building debris huts. This two-mile trip includes steep inclines and is recommended for adults and children nine years and older. Meet at the Peter's Kill Area. For more information and to register for programs, please call the Park Office at 845-255-0752. The Park will be open from 9:00 a.m. until 5:00 p.m. The fee for parking at Minnewaska is $6 per car. Once trails are groomed for cross country skiing, a per-head trail fee will be charged instead. The trail fee is: $6 per adult and $5 per junior. Snowshoes rentals are available at the park office at $15 per adult and $14 per junior. There are no additional fees for public programs, unless noted otherwise. Minnewaska State Park Preserve consists of approximately 20,000 acres of wild and scenic land located on Route 44/55, five miles west of the intersection with Route 299 in Gardiner, New York. Get in the holiday spirit this December by seeing a show at The Performing Arts Center! Join us on Sunday December 13th for performances by Imani Winds and the Klezmer Conservatory Band. And join us for Talk Cinema twice this month. Are you ready to experience something out of the ordinary? A perfect afternoon for the family – immerse yourself in this re-emerging cultural phenomenon! Click here to watch a video of them performing on You Tube! The Imani Winds are back! Last seen in a sold-out performance at The Center in January 2008 this wind ensemble will be playing holiday music to get your spirits ready for the holidays! Click here to see a video of Imani Winds on You Tube! Synopsis: When a high-powered female attorney discovers that her husband is about to leave her for another woman, she prevents him from doing so by binding him to the toilet with duct tape. Complications ensue when burglars break in to the couple's home. Click here to watch a movie trailer! For tickets, call the Ticket Office at 914.251.6200 or order online 24/7 at www.artscenter.org. For information about all performances at The Performing Arts Center, visit our website here. You are receiving this email alert because you added your email address to our website or provided it when purchasing or inquiring about tickets in the past. To ensure delivery to your inbox (not junk folders), please add center@purchase.edu to your address book or safe list. Don't miss the biggest sale of the year. Enjoy exceptional holiday savings and extended shopping hours, plus, experience Midnight Madness as most stores open their doors at midnight right after Thanksgiving. Some stores may open even earlier. Below is a sampling of many of the great offers being provided. If you do not see your favorite store listed, please contact store directly for promo info/opening times. Midnight to noon: Buzzer Beater Deals. See store for details. Buy One Get One 50% Off Of Equal or Lesser Value. Certain restrictions may apply. See store for details. Take an additional 50% off your entire purchase – storewide. *Valid on clearance and regular priced merchandise. See store for details. Buy One Get One Free. Plus, Take an Additional 25% Off Total Purchase Free Ashworth Golf Towel w/$100 Purchase. Buy One Get One Free. Plus, Take an Additional 20% Off Total Purchase Free Ashworth Golf Towel w/$100 Purchase. Promotion subject to change. See store for details. *Cannot be combined with any other offer including BNY 10% off Credit Promo. 50% off entire store*. Plus, save an additional 10% – 40% off selections throughout store. *Limited exclusions apply. Promotions can't be mixed & matched. No further discounts apply. Not redeemable for cash. Valid on current outlet price. Not applicable toward previous purchase or toward purchase of gift certificates. Factory Renewed Lifestyle® V20 home theater system – $1,499.95. Compare to new at $1,999.95. Factory Renewed 321® GS Series III DVD home entertainment system – $699.95. Compare to new at $899.95. Factory Renewed Bose® on–ear headphones – $99.95. Compare to new at $161.95. Factory Renewed Companion® 2 Series II – $59.95. Compare to new at $99.95. Factory Renewed SoundDock® Series II – $199.95. Compare to new at $269.95. Save an additional 10% off your entire purchase. Entire Store On Sale: 10% – 50% Off. No Exclusions. Nov 27: First 200 customers (or while supplies last) recieve a free cosmetic case with a purchase of $150 or more. Nov 28: First 200 customers (or while supplies last) receive a free DB lunch bag with a purchase of $150 or more. Storewide markdowns plus, take an additional 15% off your total purchase. Selected Suits $499.99. Prior sales excluded. *Not valid on previously purchased merchandise, fragrance, watches and sunglasses. Open to 10am: Receive an Additional 20% Off Entire Purchase. Receive 25% off of your total purchase of two items or more or 20% off of one item. Receive a free promo bag with a purchase of $250 or more – while supplies last. *Limited quantity only, while supplies last. Discounts taken off the lowest price on all Maidenform® Bras and Undies, Flexees® Shapewear, Lilyette® Full Figure Bras, Sleepwear and more. $199 Each: Movado Collection Ladies/ Gents stainless steel or two–tone stainless steel museum dial bracelets – original list price $795. While supplies last. Take 70% off list prices throughout the entire* store. 30% the lowest ticketed price of every item in the store. Select styles. Offer valid when signage is present and while supplies last. Free items are of equal or lesser value. Discount taken at register. All rights reserved. Not valid for the purchase of gift cards or Eco–Friendly Totes, cannot be applied to previously purchased merchandise. This offer has no cash value and is valid for in–store purchases only: Phone, mail and e–mail orders will not be accepted. Discount cannot be combined with member discount or Footwear Search program. Excludes All Styles with $.58 endings. *These are not additional discounts but promotions advertised in the store. Cannot be combined with another in–store offer. See store for full details. Buy One, Get One 50% Off, any footwear purchase. Buy One Sunglass, Get a Clearance Sunglass of Equal or Lesser Value Free. Take an additional 25% off selected styles. While supplies last. Promos subject to change. See store for details. Excludes boot styles #10061 and #10025, clearance items, Gift Cards, charitable items, and non–Timberland branded products. Valid on in–stock merchandise; not valid on prior purchases. Returns will be credited at discount price. Void where prohibited. We reserve the right to limit quantities. Select Timex Watches starting at $9.99. All Timex Diamond collection $34.99. *Does not include Revas or gift cards. Entire store 50% off – no exceptions, no exclusions. Plus, receive an additional 10% – 30% off selections throughout the store. Savings Passport Members receive discount off member price. Non–members receive discount off regular price. While supplies last. Excludes Spectacular Values; Buy 1 Get 1 Free; Buy 1 Get 1 50% off and other exclusions. See store for details. Excludes the cost of tax and shipping. It used to be that fishermen could dip their nets into the Hudson River and pull out hundreds of silver-scaled American shad. It used to be that anglers would line the banks of the Delaware River during the shad's springtime migration into freshwater, waiting for the chance to hook one of these fighters. That's how it used to be. Now overfishing has cut the juvenile shad population to historic lows. The result: The state Department of Environmental Conservation has proposed new regulations to outlaw commercial and recreational shad fishing in the Hudson River for the first time. The rules would also cut the daily recreational limit for shad in the Delaware River by half, from six to three. The DEC hopes to have its regulations in place by March, before the start of next year's spawning season. "It was the last option on the table," said Kathy Hattala, a fisheries biologist at the DEC. "We had to do it because you won't have a fishery if you don't have fish." The American shad, a bony saltwater species, has been considered a "signature fish" in our local rivers, where they spawn every March from their oceanic homes. Kingston hosted an annual shad festival until 2008, when, in its last year, the festival portended the shad's downfall by calling itself the "Shad-less Festival." For centuries, commercial fisherman scooped up shad because the female's eggs are a culinary delicacy. About 20 commercial shad fishermen still toss nets into the Hudson. Sportsmen cast for shad because they put up a legendary fight. "The sporting value is great," said Ken Schultz, an angler and author of fishing books who lives in Sullivan County. "They put on a real tug." The shad's drop-off is largely the result of overfishing in the Atlantic Ocean and local rivers, Hattala said. As other fish became the subject of federal restrictions in the early 1990s, commercial fishermen began targeting shad by trolling huge nets through the ocean. Meanwhile, fishermen here were still taking their portion, but from a dwindled pool. Federal regulations in 2005 stopped commercial fishermen from targeting shad in the ocean, but they can still be taken as a by-catch. The outlook for shad became worse in 1991, when zebra mussels were introduced into the Hudson and began eating the tiny plankton that served as a food source for baby shad during their first year of life. In 2008 and 2009, the DEC tried to help shad in the Hudson by limiting anglers to one a day, and cutting commercial fishing to three days a week. "We saw absolutely no improvement," Hattala said. The decline in average size, average age and population of young shad means one thing for longtime shad fishermen: the end of an era. "In our lifetime we'll never see shad fishing again," said Bob Gabrielson Jr. of Nyack, a commercial shad fisherman since 1971. "I know the shad are hurting now, so it's probably for the best." • Friday, December 11 - Sunday, December 13 from 9am until 11pm, shop at Barnes and Noble, 1245 Route 300, Newburgh, to help support the Hudson Highlands Nature Museum. • By using a voucher that can either be requested at the Barnes and Noble check out counter orclick here, up to 20% of the purchase price will be donated to the museum. Please note: These vouchers can be used at any Barnes and Noble on Dec. 11,12 or 13. In-store Meet the Animals! Shoppers and their children can meet some of the museum's native animals, including live reptiles, every half-hour in the children's book section during these special hours: Friday, December 11 from 10am until 2pm and Saturday and Sunday, December 12 and 13 from 12pm until 4pm. Also, remember that the Nature Shop at the Wildlife Education Center at 25 Boulevard, Cornwall-on-Hudson is also a great place for stocking stuffers and gifts! On Saturday and Sunday afternoons, November 28 and 29, the Kearney House in the NJ Section of the Palisades Interstate Park will open its Dutch doors to those wishing to stop by for some post-Thanksgiving candlelight cheer by the fireside. Staff dressed in period clothing will provide hot cider and various small treats, and will be on hand to help youngsters of all ages play period games and participate in other activities. The "tavern musician," Mr. Thaddeus MacGregor, will be on hand to regale visitors with music from olden days. MacGregor, by day a musician and teacher from Englewood, will play on guitar, mandolin, flute, and a "limberjack" named "Wee Jim," a wooden percussion instrument and toy that provides the illusion of a miniature tap dancer. Throughout much of the nineteenth century, Mrs. Rachel Kearney, a widow who brought up her nine children at the house, kept a riverfront tavern at the simple stone-and-wood structure, at what was then the busy port known to river men as Closter Landing. Staff and volunteers wearing period garb help bring that exciting time back to life. The house will be open from 1 to 4 pm on both days. A $3 donation for adults is suggested, with $1 for children (a donation box will be near the front door). The program is an informal, "open house" type affair, with no pre-registration required. Visitors are welcome to stay for as long or as short a time as they'd like. We just don't know who might happen by. For more information, please call 201 768-1360 extension 108. Show off your Custom Bike! Win "The Good Fight" and help the kids! The Good Fight Will Be Given To A Winner Drawn At Random On May 3, 2010. Tickets For A Chance To Win The Cycle World Project Bike By Roland Sands Design For Ride For Kids® Will Be Available At All 12 Stops Of The Cycle World International Motorcycle Show Series. Want a sneak peek of the Ducati Freestyle Team? Check out this TV Clip from FOX News in Dallas! Meet the Animals at 1pm and 2:30pm during the Thanksgiving Weekend! After Thanksgiving bring the entire family to the Hudson Highlands Nature Museum for a special celebration of the Museum’s live animals! The Museum’s Wildlife Education Center, 25 Boulevard, Cornwall-on-Hudson, will beopen from 12 noon until 4pm on Friday, Saturday and Sunday, November 27 through November 29. Each day there will be two holiday “Meet the Animals” programs at 1pm and 2:30pm. There will also be special crafts for children and the opportunity to view the new exhibit and hike the short "family friendly" trails. Museum admission is $3 per person. Members and children under three are free. For more information please call 845-534-5506, ext. 204. During the weekend, the Museum will also be seeking Animal Sponsors to help care for the owls, snakes, turtles, opossum, crow and other live animals that live at the museum. These animals cannot be released into the wild for a variety of reasons, including injury. Each one of the animals plays an important role in teaching people about wildlife by being on exhibit or assisting with educational programs. Sponsorships are vital to help with the care and support of these valuable animal ambassadors. Annual sponsorship packages begin at $25 and include a personalized certificate and a photo of the sponsor's new special friend. They make excellent gifts for the holidays! Visit the Museum’s website at www.hhnaturemuseum.org (click on animal sponsorship) to see a listing of all the species that live at the Wildlife Education Center. Visitors to the Wildlife Education Center will also enjoy the new exhibit – “The Sturgeon Swims through Time” – a view of 400 years of fascinating Hudson River history through the eyes of an Atlantic Sturgeon. The exhibit includes interactive elements which will engage all visitors as well as a 77" Sturgeon replica.